Not the crash you were looking for? Click here for information on the Oct. 12, 2018, fatal collision on SR 18 on Tiger Mountain. Washington State Patrol officials say a fatal car accident on State Route 18 near the Tiger Mountain Summit in Issaquah appears to have been caused by a metal driveline that skipped down the highway. The head-on crash occurred around 4:30 p.m. Wednesday and left one person dead and another seriously injured. State Patrol troopers said the driveline – typically found underneath cars – slammed into a car headed eastbound. The impact sent the car into the westbound lanes, slamming head-on into an SUV. The woman driving the car was killed. The driver of the SUV was transported to the hospital. “It is an unfortunate circumstance, so we're just trying to figure out where this came from,” Washington State Patrol trooper Rick Johnson told KOMO News. “That's under investigation where that driveline came from. There's a couple of different possibilities. If it were a driveline from a vehicle, it most likely would be disabled, but from what I understand there are other options where a driveline can be lost." State Patrol said it doesn’t know where the driveline came from. There were no disabled vehicles around the collision. According to the KOMO report, investigators said if the driveline came from an unsecured load, it would be a violation of the law. Police are still looking at how the driveline came off. The above crash took place in Dec. 2017. While police investigate where the driveline in the above accident came from, it’s important to note that every driver – whether it’s in a commercial truck or private vehicle – has a responsibility to make sure their load is properly secured before getting on a public road. Here are some startling statistics. According to a study released by the AAA Foundation for Traffic Safety, more than 200,000 crashes involved debris on U.S. roadways from 2011-14. In that period, road debris resulted in approximately 39,000 injuries and more than 500 deaths. There is precedent in Washington State for cases involving improperly secured loads. In 2004, a girl was nearly killed when debris flew off a U-Haul trailer and hit her car. The girl won a $15 million settlement against U-Haul, and a 2005 law was adopted that criminalizes a person’s failure to properly secure a load that causes injury or death. Involved In An Accident Caused By An Unsecured Load? If you or a loved one were injured in an accident caused by an unsecured load, let an experienced accident attorney fight for the full compensation that you deserve. While you may think you can handle a claim on your own, people that hire an attorney after an accident receive on average 3.5 times more in settlement money than those without a lawyer. 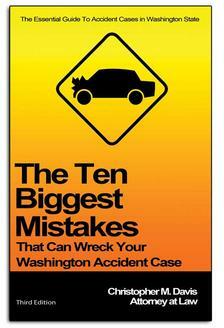 Contact the Washington State accident attorneys at Davis Law Group, P.S., today for a free case evaluation. Attorney Chris Davis has over 20 years of experience fighting for his clients, and knows the ins-and-outs of cases against trucking companies and their aggressive legal teams. Call (206) 727-4000, use the chat feature below or fill out the contact form on this page today.